I' trying to set up my client computer but When I hit "client" it won't allow me to enter the servers IP address??? Hi @Kristen. Please provide more details about your machines (OS, 32/64 bit, Synergy version installed, connected to the network via Ethernet or Wi-Fi, specify which one is the server). 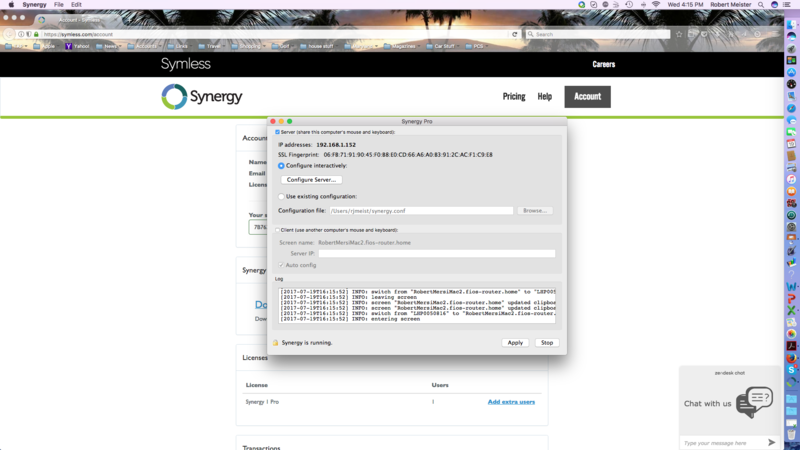 Also, post a screenshot of both machine's Synergy interface and the Server Configuration interface on your server machine. This is the "client" on my HP laptop. I'm not sure how to send a screen shot from my MAC. I'm on WIFI...and not sure what the 32/64 bit meant and can't remember what I chose??? I'm wondering if I just need to change the client name on my laptop and then the server will recognize this??? did you get any of my information? I might be able to answer that once you have posted all of the screenshots I need. Give him a minute Kristen! You can't expect a reply immediately after yours. Jeez. Hey @Kristen. Do this on your Windows machine. Sorry but who in the hell is Ramzi? Do you think this is a professional response? I waited for nearly 45 minutes...so giving him a minute is insane! Please tell me "Ramzi" is not with your organization? If not, Ramzi...go take a hike!